This high quality raw Pu-erh has the distinctive melon shape. 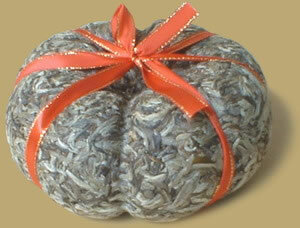 The tea has a high concentration of unopened silver buds, weighs about 500 grams each. As beautiful as its shape, this raw melon Pu-erh makes an aromatic treat today, or may be put away to produce what is sure to be a rare and valuable treasure in the future.